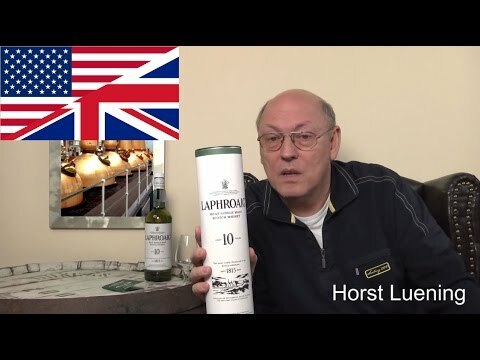 A revelation to some but simply disgusting to others, Laphroaig 10 is probably the most intense of all Single Malts. Your taste buds are confronted with the shock of the unfamiliar, dominated by peatiness. The nose reminds of an old steam engine, road tar and burned rubber. Rotting seaweed, iodine and mineral notes combine with chimney smoke, TCP and a cold ashtray. Flavorwise, an overwhelming phenolic blast subdues the underlying sweetness. Crisp oak and salty dryness characterize the peaty finish. Whether you love it or hate it, you certainly won't forget it! Dominated by peat smoke - not overly antiseptic, more like burning coal and tar. Some caramel sweetness coming through. Some maritime notes, maybe seaweed. Hard to pin down much more. The smoke is that dominant. Arrives sweet followed immediately by a massive blast of acrid peat. Mouth coating. Transitions slightly into saltiness. At times a little citrus just peeks through before being mercilessly crushed by the peatiness again. Medium/long. Wood ash, residual peat. Fairly sweet, dries out into oakiness. I've had this before, but I realised that I'd never reviewed it previously. To me this is very much the basics of what a peated whisky can be. It's VERY pungent with the peat smoke almost to the exclusion of everything else. There is a little spirit involvement on the palate but not a lot. It seems somewhat counter intuitive to me that what is possibly the most accessible peated single malt whisky (in terms of availability and price) is probably not one that I would recommend to beginners. Its just too pungent with the peat as far as I'm concerned. Though some of that is personal preference, I think they do a much better job with the quarter cask release which has that much more wood involvement to balance out the smoke.